I hope you all survived the iDSD Weekend...? Do you know what is absolutely horrible? Being flat broke on iDSD! I had about $2 to spend this weekend and with all the sales and can't-miss-deals, I was devastated. But when the darkness is as dark as can be, someone flips the switch and light shines again. Your very generous donation saved my weekend! That is what I love about this world wide scrap-family. We are there for each other - knowingly or not. And speaking of being there for each other - Please visit "Your Gallery" where I have just posted 2 new layouts made by Kathy Overman. They are not only beautiful, they are also about one of my favourite places in the world: The Sistine Chapel in Rome. Go see them and let us know what you think. And now for today's freebie. Yes, it's still Halloween, but I must admit, I am not quite sure if you can use it... 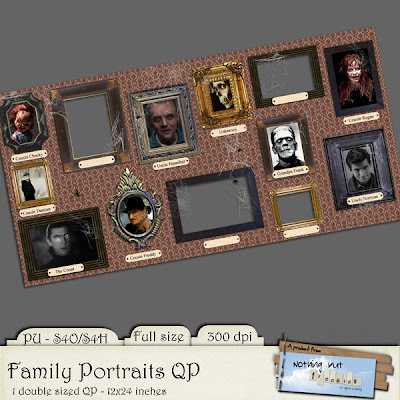 I made a double sized QP (12x24) named "Family Portraits" with all the relatives we do not EVER talk about (we all have them, don't we?). I have made room for 4 of your own unspeakable relatives. I will be back in a couple of days with the absolute final Halloween posting - I mean it this time! Hope to see you then. I also wanted to say congratulations for being acknowledged on Sue's blog today. I'm glad that someone else has found the idea inspiring and has decided to run with it. We all need a little more gratitude in our lives. it's terrific! thank you so much! I wasn't able to shop either, my hubby is still on temp disability - but on the up side I did win a few kits and snag a whole bunch of free goodies! Hopefully next year I can shop!